Margaret von Kaenel has a bachelor's degree in fine art from the University of California and an MBA in Marketing/Management from Johns Hopkins University. She has been professionally trained in the decorative arts through a variety of trade schools: The Decorative Arts Center of St. Louis, MO; The Faux Academy in O'Fallon, IL; ProFaux of Canton, OH; the North America School of Decorative Arts (NASODA) in Chicago, IL; Koch Brothers Studio in St. Louis, MO; and Melanie Royals Design Studio in San Diego, CA. She is a member of the Stencil Artisans League Inc (SALI); the Stenciling Round Table (SRT) - the online SALI Chapter; the Atriumonline - founding member and Secretary/Treasurer; Metro Artisans Guild - the Missouri SALI chapter and founding president; and the Society of Decorative Painters. Since 2001, Margaret has participated in St. Louis Designer show houses for ASID, Cardinal Glennon, St. Louis Symphony, the Dove Foundation and St. Louis Homes and Lifestyles with notable interior designers as well as on her own. 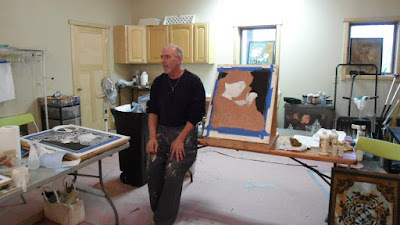 Margaret's portfolio specializes in murals, trompe l'oeil, grotessca, grisaille, floor cloths and custom textural wall finishes including Venetian plaster, Luster stone, marmorino, sandstone and cement. She is insured through SALI.